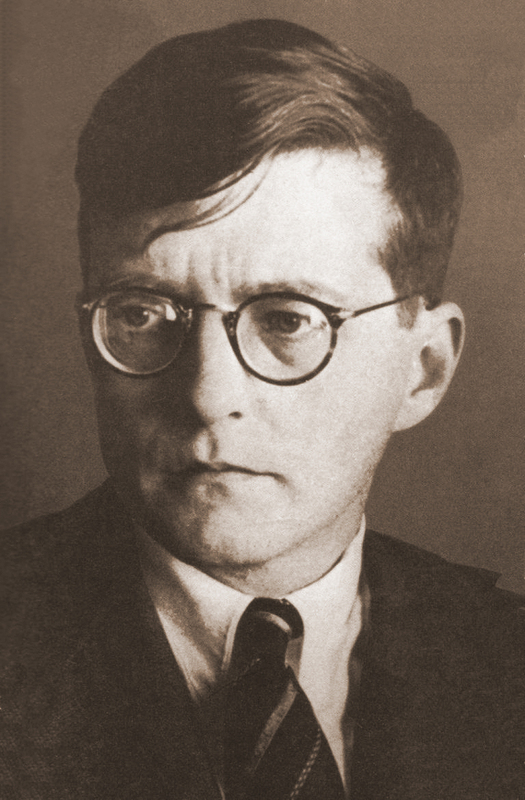 Dmitri Shostakovich in 1942. Official Soviet Army photo. Dmitri Shostakovich was a Russian composer who endured the rise and reign of Communism in the Soviet Union. Despite immense talent and initial popularity, the regime rejected him: After his opera Lady Macbeth of Mtsensk gained critical acclaim in 1934, Pravda trashed it in a review that Stalin himself probably wrote. That started a long period in which friends wouldn't speak to him and he couldn't find much work. Shostakovich slept with a suitcase by his bed in case the Communists came for him in the middle of the night. He was never a robust man in most senses of the word, and through several rehabilitations and re-dehumanizations his nerves frayed badly. Yet he was robust, and brave, in the music he wrote; his son Maxim once asked him, during a rehearsal of the 11th Symphony, "Papa, what if they hang you for this?" Maxim was nineteen at the time. The Soviets didn't hang Shostakovich, in part because he allowed himself to pen mealy-mouthed non-subversive explanations for his subversiveness and obsequious apologies for crossing the Red line. His whole career was that of a man who kneels before a throne while muttering curses under his breath. Shostakovich outlived Stalin, but not Communism. He died in 1975. I was only six, and unaware of my loss. There's much more to know, and for anyone interested in his life and music I gladly recommend Professor Robert Greenberg's lectures from The Teaching Company. Prof. Greenberg has the sound and attitude of comedian Lewis Black, but without all of the vulgarity. You can listen to excerpts or buy the course. Right now, the digital download is on sale for 20 bucks -- just $3.33 per hour. It's insane. Go get it. I'll wait. For the remainder of this essay, I will focus on one masterwork that speaks to me about our own time: Symphony #7, the Leningrad. In fact, I will narrow my focus even further, to about ten minutes of the most terrifying music ever created. It is the so-called "Invasion Theme" (though Shostakovich never called it that). Before I go further, I'd like to note a few things. First, I'm an amateur, completely uncredentialed in music and Russian history. My goal here isn't to give a musicological explanation of anything -- I've left out some things that are well-known, in fact -- but to show you what I think the music says. Second, there is no record of Shostakovich describing the symphony in the terms I'm about to use. The official explanation is that the Invasion Theme represents the Nazi invasion of the Soviet Union and siege of Leningrad. That seems laughable to me, even when I hear Bernstein (whom I admire greatly) in rehearsal saying that it's supposed to parody Nazi goosesteps. Rather than trusting Soviet propaganda, I trust my ears, and the quite real goosebumps I got when first hearing it. There is, fortunately, some evidence that suggests that I'm not out of line for doing so: Some witnesses say he composed it before the invasion, and intended it to represent a different kind of evil with which he was dreadfully familiar. Third, I'm not saying that this is how each section must be interpreted. I'm offering an interpretation that makes sense to me and fits overall. I don't want to put words in Shostakovich's mouth; I'm just translating what he does musically into what seems right to me. Fourth, I have heard performances of the Leningrad that completely failed to give me the feelings that I'm about to describe. Sorry, but I count those performances as defective. You may want to listen while you read. I recommend you start at the beginning, which is full of solid Russian drama and beauty, but if you want to skip to the Invasion Theme, it starts at 6:54. Recall the official explanation: The Invasion Theme is the sound of Nazis attacking the Soviet Union. The beginning of the Invasion Theme, though, is very quiet. The German blitzkrieg (literally: "lightning war") was a shock to the Soviet people. There is no correspondence, and I won't mention the official explanation again. If listening conditions are poor, you may need to start with the volume up and turn it down as it goes on. Don't turn it down too much, though. The ever-rising volume is part of what Shostakovich wanted us to experience. The Invasion Theme starts quietly, innocuously; in this version, it's difficult to hear. Either way, it's simpleminded, banal, boring. There's a quiet snare drum, barely tapping out a military cadence in the background. Imagine these as the words of the political left. For the Bolsheviks, these slogans included things like Peace, Land, Bread and Land and Freedom. Today, they might be Brotherhood, Freedom, and Equality. Bits of the theme are long-winded -- From each according to his ability, to each according to his need, perhaps. Yes, the words are trite, but inoffensive. Who can argue with them? Who would fight seriously against them? Where is the threat? For several cycles, the melody is played at ever-so-slightly louder volumes, with slightly more accompaniment. There's a bit of rumbling in the bass. The small group is building up its cadre, quietly, calmly, with hardly a sign of conflict to come. Soon (8:52) we hear a tentative repetition of each phrase: a student waits until the master has finished before making an identical statement. The time for this sequence is doubled as the student learns his propaganda, but that's okay -- they're patient. What are they learning? The same things as before: Peace, Land, Bread. Brotherhood. Freedom. Equality. The next cycle (9:59) adds muted brass and confidence. The harmony lines are rising somewhat, eagerly. The drum gets louder to keep up. The orchestra seems almost jolly. Why so chipper about such trivial music? I suppose everyone likes to be on a winning team: They're on the right side of history. The next cycle (10:36) also uses repetition, as with the student and teacher, but this sounds more like a group leader and one or more group members. The member is eager and confident enough to overlap his melody with the leader: They are learning together, and there are no delays. Things are progressing faster. Now (11:11) the strings enter, fleshing out the chords, increasing volume yet more, adding a slightly acidly dissonant texture. The percussion is getting louder to keep up with the other instruments, and is helping to drive things forward. Repetitions at 11:48 and 12:23 are getting more frenetic. Everyone is speaking with one voice, marching perhaps, proudly proclaiming their mind to everyone who will listen, and many who would not. Look at the strokes of the string players -- they are already using full strokes of their bows. Another repetition. Listen to the build up. At six minutes into the sequence, the formerly banal and silly theme has become insistent, demanding, even hostile. Peace, Land, Bread! Brotherhood! Freedom! Equality! It can't stay like this. This is as far as the theme can go on its own. At 12:59, the leadership has arrived -- and we leave reason behind. A chorus of dissonance makes siren calls over the top of the music. They will not be silenced. They are not the original theme, and peace is not in them. It changes all that is below it or that came before. They force your attention on them and their demands. The main body triumphantly carries the sirens on its shoulders with its shouts for the platitudes of peace, land, and bread. At 13:35 waves of discord enter. They were there in the very beginning, the "rumbling in the bass", but now they are loud and setting everyone off balance. The theme itself is becoming overwhelmed by everything going on around it, drowning in these waves. There is more percussion -- the jangling of tambourines. 14:11 More non-theme material: The orchestra starts marching madly, 1-2-3-4, the theme being just a carrier for everything moving along with it. This is clearly martial, with violent percussion and xylophones cutting through to reach every rank and file. Note that these are precisely the same "words", the same theme, that started so placidly before. Peace, Land, Bread. Brotherhood. Freedom. Equality. But now the orchestra is screaming them at the top of their lungs, along with other and more violent slogans. All is vicious, hateful, destructive, vengeful. 14:46 Now the theme changes: Though shouting approximately the same melody as before, it is a new voice. It has rejected the old key, bending it to minor. It rips apart and reassembles the large-scale structures of the earlier cycles. It coopts previous musical phrases into different sequences. It's clearer: the muddying bass has been eliminated. It drives the music before itself, fracturing bones and lives. All pretence of other values is gone. Who provided this violent clarity, sweeping all else out of its way? This is Stalin, taking his throne. 15:30 The "words" are still there, coming faster and more hateful. Something feels like it's going to burst. 15:50 Shrieking over the top of it all. Madness. Violence. The theme is quoted, but is no longer what it was. 16:05 This feels impossible. How can it go on? The drums are berserk, the noise is shattering. 16:29 The chaos ceases, the drums stop beating, and everything is overtaken by the rise of a mighty voice. The themes we have heard -- Russian themes from the first ten minutes, fragments the Invasion Theme -- are reflected in that voice, but the voice controls everything. The tympani drive forward and the cymbals crash to his tempo. He pulls all themes to himself. 17:54 The theme is repeated, controlled now, but not at all as it once was. The voice is triumphal then, in a major key, all one voice. Soon everything around him sinks down, muted, pretending once again to be merely ordinary and Russian, a constantly moving and jittery "peace", until the solo flute begins a funereal song at 19:29, going solo at 19:36.
Who is this reclusive voice, stunned and wondering what has happened? I would say it's Shostakovich, but he didn't use the DSCH motif with which he normally identifies himself. Perhaps it's not him, or perhaps he merely wasn't bold enough to say that it was. The orchestra joins in what feels to me like a dirge. The theme has collapsed into death and mourning. This is Shostakovich's warning to us -- to anyone who will listen -- from Stalinist Russia. It's the impossible, inevitable, seamless advance of Leftist terror, from its beginnings in inoffensive platitude to its culmination in rage and murder. Did Shostakovich ever address the more _general_ question of interpreting music allegorically, interpreting it as having meaning in the real world, rather than as "pure art" without verbal meaning? At about 10:30 and on for a while I Wonder if he isn't also making fun of Bolero, by doing it far better, and almost as a little sideline extra. There's some controversy about who he really was and what he really meant by many of these things: He died in 1975, but in 1978 a friend named Volkov published Testimony, a book he said was Shostakovich's memoirs as dictated to him. If true, as it appears (at least roughly) to be, then my interpretation is probably true to the intended spirit. Did he have such literal intentions? Hard to say. If someone wanted to criticize me for being too literal, I wouldn't argue except to say that music also has meaning in the ear of the listener. Floyd, Shostakovich is said to have said to his friend Isaak Glickman, "I suppose that critics with nothing better to do will damn me for copying Ravel’s Bolero. Well, let them. That is how I hear war." Floyd, I am not sure how S. is copying Bolero, since they are about such different things in the two. Bolero is a dance, after all, and not one of chaos. It seems to me that the notion this can refer to the German invasion is given the lie by the beginning: the Germans invaded with blitzkrieg, and this starts out simple and modest. No, it has to refer to something that makes its way in by subterfuge, where it seems one thing to start and only much later does it show its true colors. I'm folding laundry and ran out of things to listen to. This came up on my playlist. I listened to the first segment. What was my first impression of the Invasion Theme? Of course: "It's starting now? Too soon." Yes, it's always too soon. I have played some his works, most notably, his Tenth Symphony, which was written the year Stalin died. His music is very personalistic in nature, but there are common themes scattered throughout his ouvre. A nice starter piece to listen to (fortunately, unlike some of his works, very short) might be, A Festive Overture, for band. Many high schools and college see play it. I am sure you can find it on YouTube.